Does Baha’i scripture discriminate against LGBTQ people? No. “Whatsoever hath led the children of men to shun one another, and hath caused dissensions and divisions amongst them, hath, through the revelation of these words, been nullified and abolished.” – Gleanings, p. 95. “According to Baha’u’llah the purpose of religion is to educate and bring unity: God’s purpose in sending His Prophets unto men is twofold. The first is to liberate the children of men from the darkness of ignorance, and guide them to the light of true understanding. The second is to ensure the peace and tranquility of mankind, and provide all the means by which they can be established.” – Gleanings, pp. 79-80. And for Baha’is, unity doesn’t mean sameness — far from it. Abdu’l-Baha wrote: Consider the flowers of a garden: though differing in kind, color, form and shape, yet, inasmuch as they are refreshed by the waters of one spring, revived by the breath of one wind, invigorated by the rays of one sun, this diversity increaseth their charm, and addeth unto their beauty. Thus when that unifying force, the penetrating influence of the Word of God, taketh effect, the difference of customs, manners, habits, ideas, opinions and dispositions embellisheth the world of humanity. This diversity, this difference is like the naturally created dissimilarity and variety of the limbs and organs of the human body, for each one contributeth to the beauty, efficiency and perfection of the whole. When these different limbs and organs come under the influence of man’s sovereign soul, and the soul’s power pervadeth the limbs and members, veins and arteries of the body, then difference reinforceth harmony, diversity strengtheneth love, and multiplicity is the greatest factor for co-ordination. – Selections from the Writings of Abdu’l-Baha, p. 291. However, some Baha’is might think their Faith discriminates against LGBTQ people, because they interpret letters written from the 1920s through the 1950s on behalf of Shoghi Effendi, the Guardian of the Baha’i Faith, as Baha’i scripture. Four of these letters refer to homosexuality as an illness. These letters of guidance incorporate the medical understandings of the times, presumably appropriate guidance for the recipients of the time. But for Baha’is, only Baha’i scripture is unchangeable and divinely-inspired. Scripture refers to the original writings of The Bab and Baha’u’llah. Abdu’l-Baha and Shoghi Effendi interpreted these writings, which Baha’is also consider authoritative and unchangeable. For other questions, the Universal House of Justice, the democratically-elected head of the Baha’i community, can change and modify Baha’i policies. And because Baha’is believe in the agreement of science and religion, Baha’i policies can and do change as science advances our knowledge and understanding. Until recently, the Universal House of Justice referred to homosexuality as an aberration or as an illness, but this policy has changed. Since 2010, the policy of the Universal House of Justice asks Baha’i communities to work at removing any discrimination against gays or lesbians, whether they are Baha’is or not. …With respect to your question concerning the position Baha’is are to take regarding homosexuality and civil rights, we have been asked to convey the following. The purpose of the Faith of Baha’u’llah is the realization of the organic unity of the entire human race, and Baha’is are enjoined to eliminate from their lives all forms of prejudice and to manifest respect towards all. Therefore, to regard those with a homosexual orientation with prejudice or disdain would be against the spirit of the Faith. Furthermore, a Baha’i is exhorted to be “an upholder and defender of the victim of oppressionâ€, and it would be entirely appropriate for a believer to come to the defense of those whose fundamental rights are being denied or violated.” Universal House of Justice, 27 october 2010. In the same 2010 policy of the Universal House of Justice, they also state that marriage for Baha’is can only be between a man and woman. Please see my next article for a discussion of this. Watch this 12 minute TED talk where Canadian poet Shane Koyczan puts his finger on the pulse of what it’s like to be young and different. It contains snippets of the animation “To This Day,” with his spoken-word poem (which was created, crowd-source style, by 80 animators). This and his 7 minute video “To This Day,” got me thinking about how to deal with bullying for the child being bullied or for other children who might witness the bullying. This inspired me to start looking at making a video on this theme on ways to help the the kids – so they might have ways of responding at the moment the bullying happens. As a child running to a teacher or any adult was not a possibility for me. But if another kid had sung “bully bully what’s your beef” it would have made all the difference. I love his film “To This Day” which raises awareness about the deep suffering caused by bullying. I am so grateful that I managed to overcome the years of depressions and low self-esteem caused by the bullying and beatings I experienced as a child. But I am thinking in terms of a tactical approach. What fun things could kids have as a form of antidote? – games, sayings, etc to combat prejudice and to make it known – also because so often kids (and adults) say things not realizing the prejudice in words that seem familiar to them. Even words such as “spiritually diseased” is name calling or scapegoating when it is used to push people away or to justify discrimination. If we have a counter argument or sayings, it raises awareness. So please share any catchy phrases or ideas you might have. “Sarah Goes To Church” is an engaging and insightful blog on her independent investigations into different religions. So she went along to find out about the Bahais of Webster Groves, Missouri, along with her partner with the dazzling pink hair. And then you’ll see that the bottleneck for her is that Bahai’s need to stop treating homosexuality as a form of ‘abberant’ sexuality. Bahaú’llah’s teachings were for equally and the principle of equally makes no sense if it is just for some people. I’m referring to what Abdul-Baha meant by “spiritual teachings” – Teachings that are eternal, not social teachings which do change, and in particular social teachings which the U.H.J., the head of the Bahai community, may rule on such as defining what marriage is. “The one is the call of civilization, of the progress of the material world. This pertaineth to the world of phenomena, promoteth the principles of material achievement, and is the trainer for the physical accomplishments of mankind. It compriseth the laws, regulations, arts and sciences through which the world of humanity hath developed; laws and regulations which are the outcome of lofty ideals and the result of sound minds, and which have stepped forth into the arena of existence through the efforts of the wise and cultured in past and subsequent ages. The propagator and executive power of this call is just government. Currently the U.H.J. 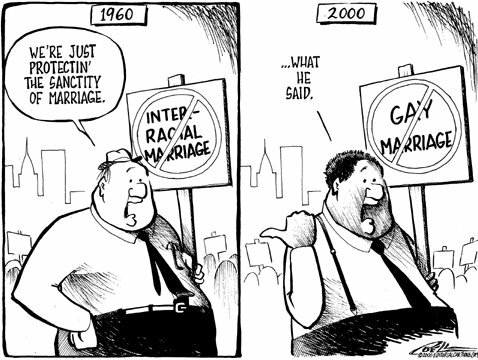 states that marriage can be only be between a man and woman but another U.H.J. in the future might have another definition. What is a shame is that because of their current position, Bahais see this as justification to continue to discriminate against gays. I realise it must be tough if you are a Bahai and you believe the Bahaí Faith doesn’t change or you don’t like gays. But for the sake of the health of religious community that preaches equality for all, a first step for a Bahai community would be to remove any public display or reference to homosexuality that associates it with disease or otherness. And second step is to stop referring to gays as if their identity is tied to whether they are celibate or not. How would you feel if each time you met a Baha’i your identity as a holistic human being was focused on your sexual orientation?